Enjoy Gluten-Free & Dairy-Free Lebanese Cuisine on BakeFree. Share Easy Recipes for Main Dishes, Desserts, Soups, Salads, Bread, Snacks & Vegetarian! Hello! My name is Siham Costantine Semaan. I was born and raised in Lebanon and I have Celiac disease. I have a passion for food and cooking, so I'm sharing with you all my experience in preparing gluten-free bread, cakes, pies, and cookies. I also have a passion for the Lebanese kitchen and Middle Eastern cooking. You can find my delicious gluten-free recipes, try them, and enjoy them with your family and friends. Thank you for stopping by! Hello! My name is Siham Costantine Semaan. 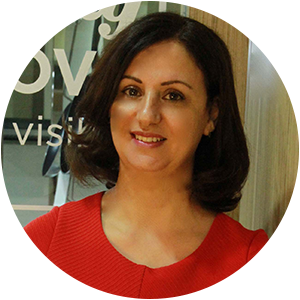 I have a passion for food and cooking, so I'm sharing with you all my experience in preparing gluten-free recipes. I also have a passion for Lebanese and Middle Eastern cooking. You can try my delicious gluten-free recipes and enjoy them with your family and friends. I was born in a traditional Lebanese family where everything rotated around food; Christmas dinners, Sunday lunches, and everyday home cooking. My relationship with food was always a love/hate relationship. I loved food but it always caused me discomfort and pain. In my childhood years, I was always anaemic and the doctors would tell my mom to give me iron supplements, and to feed me spinach and red meat. My teenage years were years of migraines and joint pain. The doctors would attribute that to “part of growing up”. I got married in 1987; I was 22 years old; I had my son one year later. In 1992 when I was pregnant with my daughter, my OBGYN said that I would need blood transfusion during delivery because of my severe anaemia. I was sick throughout my pregnancy and I was very weak. Luckily, I had a healthy baby girl, but I lost all my energy after giving birth. "Join me on my journey of exploring new horizons to food!" 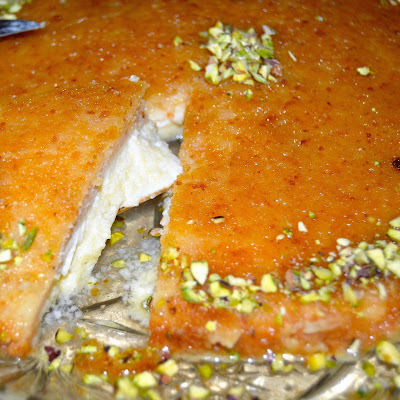 Knefe (Kunafeh) is a traditional Lebanese dessert that is served for breakfast. It is sweet pastry stuffed with gooey cheese and soaked with sugar syrup. It is very famous in the Middle East, especially in Lebanon, Syria, Jordan, and Egypt. 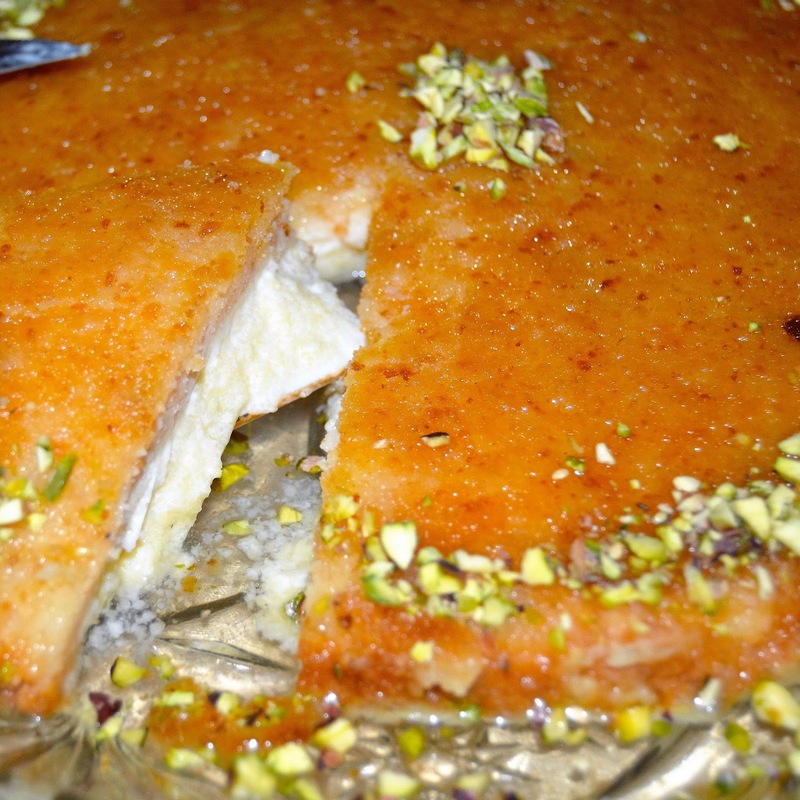 It is very similar to the Greek Kadaifi and the Turkish tel Kadayef. My recipe of gluten-free Knefe is delicious and as good as the traditional one. Don’t deprive yourselves of Knefe anymore. Try it and enjoy it for breakfast! Slice the white cheese into thin slices and soak them in clean water for two days. Change the water every 3 hours the first day and every 6 hours the second day. Taste the cheese and make sure there is no taste of salt at all. Keep the cheese in the fridge at all times. Put the cheese in a strainer in the fridge overnight until all the liquid is gone. In case the cheese was still wet, pat it dry with kitchen paper towels. The cheese will be gooey and soft. Put the breadcrumbs and soft butter in a bowl. Mix with your hands or in the food processor until you get a paste. Spread the paste in a round oven tray. Pre-heat the oven to 200°C and bake the crust for around 30 minutes or until it’s golden brown from both sides. Meanwhile, put the polenta and the milk in a saucepan on the heat. Cook the polenta until it absorbs all the milk and it starts bubbling. Put off the heat and add the mastic gum, orange blossom water, and rose water. Mix well and keep aside for few minutes. Once the crust is golden brown, take out from the oven, lay the cheese on it and add the polenta and milk mixture. Make sure the cheese and the polenta mix covers all the crust. Put back in the oven and bake for 20-30 minutes until bubbly and thick. Take out from the oven and wait for 15 minutes before you turn it into a serving plate. Pour the warm syrup on top of the Knefe and serve warm. Put the sugar and water in a saucepan. Bring to a boil and add the lemon juice. Lower the heat and let it simmer for few minutes. Turn off the heat and add the orange blossom water and rose water. Let it cool for 30 minutes before you pour it over the knefe. Hi Siham, would this work the same if i used the ashta filling as opposed to the cheese? Yes it will, but you have to make sure that the ashta filling you are using is gluten-free as well.